If you get the following error message during the installation of Photosuite, proceed as below. Posted in EN, FAQ, PSSuite and tagged error, Hasp, Installation, PSSuite, Sentinel, Windows 8, windows 8.1 on March 19, 2014 by Mitsubishi Electric Europe B.V. Printers Group. 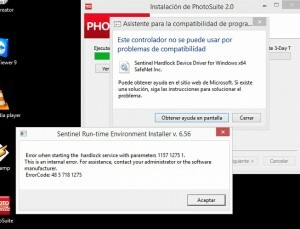 Si durante la instalación de Photosuite le aparece el siguiente mensaje de error, proceda con las indicaciones. 1. Compruebe que Windows tiene todas las actualizaciones instaladas (ejecute Windows Update). Posted in ES, FAQ, PSSuite and tagged error, Hasp, Instalación, PSSuite, Sentinel, Windows 8, windows 8.1 on March 19, 2014 by Mitsubishi Electric Europe B.V. Printers Group.